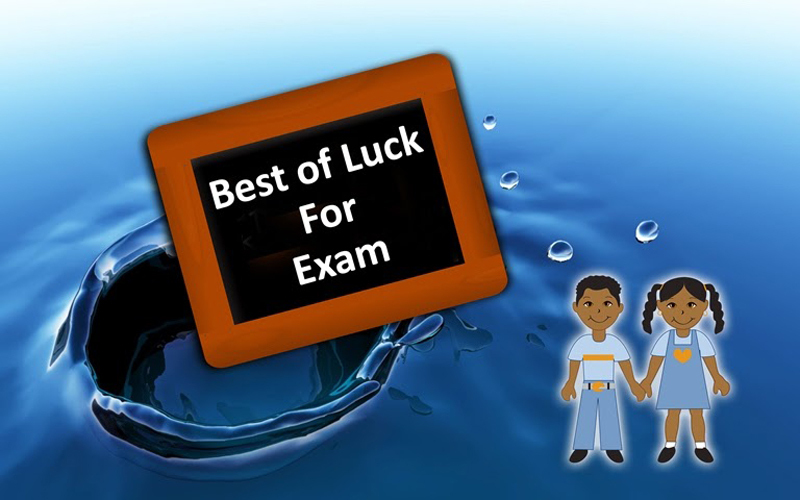 Exam Wishes and Messages : It’s a special day when our beloved someone like any of our family member, siblings, students, lover, friends or relatives have to sit for their exams or test. Whatever it is a final exam for school, collage or for job, skills or any kind of test just tell them believe in self and you want their success and well performance. 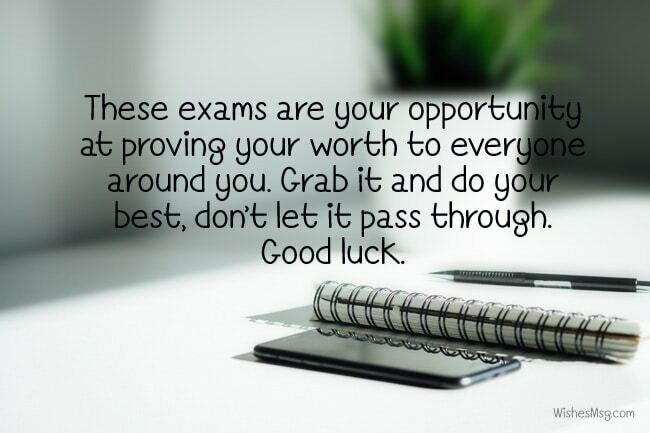 So, send exam wishes with a motivational messages or with some funny words on their Facebook, Instagram or as private message to say best of luck for exam. Put your best effort on the exam and god will surely crown you with success. My good wishes will always be with you. Best of luck! Luck is a funny thing because sometimes it can be good and sometimes it can be bad. So take matters in your own hand, study hard and stop relying on something so fickle. All the best. May all your hard works before exam be rewarded with the best. May you obtain the highest marks and your success be continued. Exams are the perfect occasions for showcasing your talent and determination. May the blessings of god be with you during the exams. I believe you have taken every step to win the battle tomorrow in the exam hall. Don’t be confused ever because hard works always pay off! Your talents can not be measured by the exams but your dedications are always reflected by the marks you obtain. 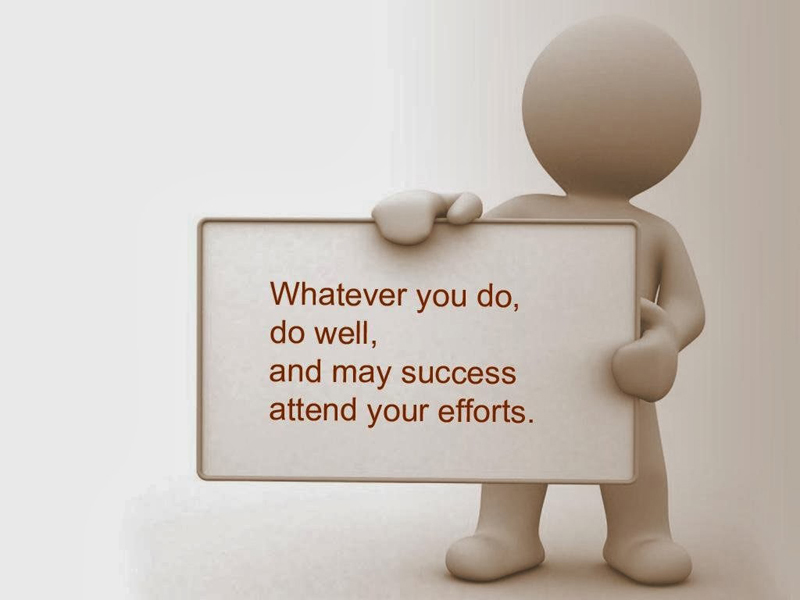 Wish you be rewarded with success! If you believe in yourself you do not have to fear any challenge. I wish you all the success for your exam! You prepared well, you know it all right, just relax over the night. You just need a little rest. Best of luck for exam! I am not going to wish you good luck. Awesome students like you never need luck to be by their sides – they create their own destiny. Go for it. There is a saying: ”Don’t stress, do your best, forget the rest!” Remember this when you’ll star your exam, just stay calm, write what you know and pray that you pass! Instead of stressing out and jinxing yourself for the worst, just focus of studying hard and beating everyone to come first. Good luck. An exam is not only a test of your academic knowledge, it is a test of your calmness, stability and courage. All the best. God does not make the hills you have got to climb any smaller but god can make the climbing easier. Therefore I believe you will manage these tasks with the help of god! When you enter the exam hall with a positive mindset, you’re bound to succeed. Good luck with your exams. Keep making us proud! Now is the time to show your teachers and friends that you are no less than a genius. My prayers are always with you. Good luck! You have learned so many new things in school. Its time to show them practically. Have a great exam tomorrow! Good luck from me! Leave no page on the book unturned. Let no time be wasted before the exam. I know you will succeed. Good luck to you! 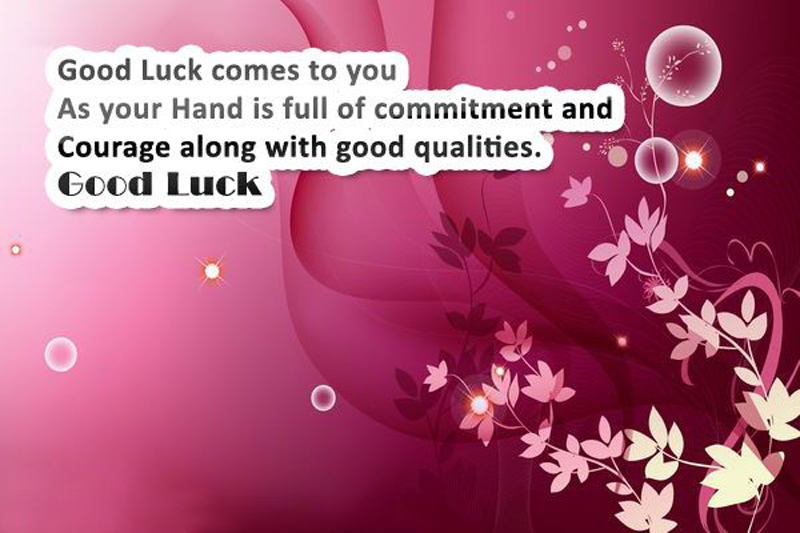 Good Luck comes to you as your hand is full of commitment and courage along with good qualities. Best wishes for your exam, Good Luck! These exams are your opportunity at proving your worth to everyone around you. Grab it and do your best, don’t let it pass through. Good luck. Better grades can get you a better job, better car, and a better life. Exams are worth the trouble after all. Good luck. If you want to touch your goals, you have to do well in the exam. Exam will give you the opportunity. So, try to give the best effort in exam. Good Luck! In your life, you can’t get anything easily. You have to earn that. We all have to go through our educational system. Exams are the options which help you to go ahead. So take it carefully. Best of luck! Failure & success are the two sides of the same coin. So don’t get nervous. I know you can do well in the exam. Failing in a exam is not so serious issue in life. If you have failed today then try the best for tomorrow. I know tomorrow will show us your talent. Be confident! Good luck! Exam is waiting for giving you a chance of testing your knowledge. Just believe in yourself! Best of luck! Exams can prove you how brilliant and intelligent you are than the others. So, you should grab the opportunity. Best wishes for you! In life, it is impossible to be 100% sure of whether you will pass or fail. But working hard is a sure shot way to increase your chances of doing well. Good luck. Don’t be nervous. 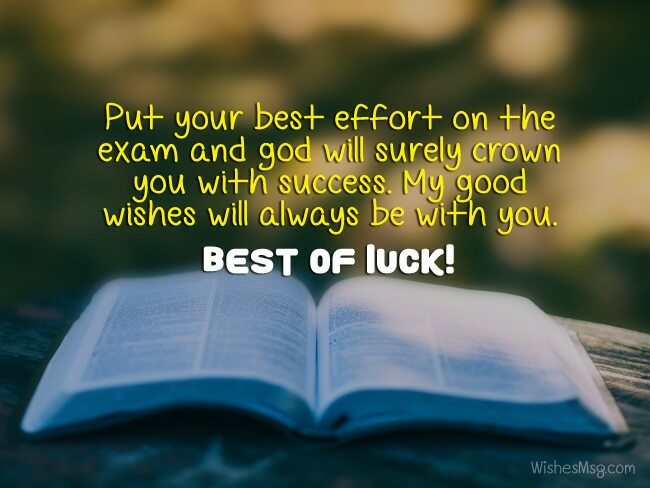 Because when the hard works you have done will be combined with my prayers for you, your exam will be a great one! Everyone has bad exams in their life. So, don’t look back and regret. Look forward and take the best preparation for tomorrow. My prayers are with you! I pray to god that he makes you a winner tomorrow. May your exam be a great one and may you obtain the highest marks! You have to make the best use of your talents and knowledge so that we can proudly say that all our prayers never went in vain. There will be no question on the paper that can stop you. Because you have studied everything in syllabus. We are praying for your success! Dear sister, are you busy with your study? I know you are a brilliant one. So I don’t need to wish you Good luck. Because brilliants don’t believe in luck, they create their own destiny! My best wishes are always with you! Dear brother, exam is the best way by which you may judge your knowledge. Earning a good GPA may confirm your bright future. So, give your best effort in exam! Good luck! As an elder sister I have the responsibility to take care of yours during your exam. But unfortunately I can’t do this. But I know my brother and sister. You always give the best effort in the exam script. Wish you all the best Dear! You know, examination is the platform for your future? If you do well in the exam then it is the way of obtaining a good CGPA. And if you have a good CGPA then it is the confirmation of your bright future. Good Luck my dear sister! Don’t let any activities obstruct you from achieving your goal. Take every steps of your life seriously. Examinations are one of the basic steps for your success. So take it seriously. My best wishes for you my dear brother! Sister, I know you are the best. Your exam is knocking at the door. Don’t feel nervous. Be confident and keep calm. You can do it. Best of luck for your exam! Follow your dreams with Dedication and You will surely make all of them come true. Good Luck and all the best for your exam. Study hard, so everyone knows, That you can be the one who really shows, That exams are not difficult, Neither are hard. Good Luck for your exam! Dear Bestie, I know you are the best one in our group. Tomorrow is your exam. I hope you are ready for this. Always be confident as you are always. Wish you all the best! Dear, I know how hard you’ve been preparing all these months. Now it’s the time to show everyone what you can do. Our teachers will be so proud of you. I’m sending all the good wishes for you. Good luck for your exam! My dear friend, I wish all your dreams will come true. Just believe in yourself. And give your best effort in the exam hall. I hope you can do it. Wish you all the best! Be relaxed! When you enter into the exam hall, keep your all stress out of the door. Be calm! Dear friend, Good luck for your exam! Exam does not judge our knowledge. Avoid cheating in the exam hall and show your skill. Be confident! Best of luck! Dear best friend, I know nothing can make you down. Nothing can damage your confidence. Best wishes for your exam! Study hard and make her feel you are special! Best of luck for your exam! Good luck for your test. The only person who can create your future is yourself. I believe in you! Honey, Just keep one word in your mind that success and failure have ups and downs, so you have to push ahead with your confidence. Be confident. Wish you all the best! Sweetheart, do you know one thing that exam is hard for those who are not ready for it. But I know you are ready for everything! Go to the exam hall and show your hidden talent in the exam script! Good Luck! Dear, Don’t worry about the exam result. Exam is just a process. The result can’t judge your skill and knowledge. So be confident! Best of luck for your exam! Honey, I know you have the sharpest memory. So, be confident and focus on your own skill. Try to give your best in the examination script. I hope you can do it! Good Luck! Sweetheart, your exam is knocking at the door. So you have to keep all your tension and stress outs of your mind. Give the best effort in your exam and build up your future. Wish you all the best! Examination is the best platform for building up your future. So take it seriously and give it a hard push. I hope you can do good. Good Luck for your exam! Today is a very important day in your life. I wish you to remember and use all the knowledge that you learned in school. Be positive and calm, because today you truly need it. Good luck! The easiest way to do well in the exam is thinking the exam like a giant who is punching your head. So you need to assemble all your strengths to get rid of the giant. Good luck! The funny side of exam is that whatever you do in your room your parents don’t disturb you! But don’t think you can do whatever you want, study hard and give the best effort in exam. Wish you all the best! Don’t eat an egg before the exam or you will get the egg size mark! It’s a joke, don’t take it otherwise. Best of luck! Exams are like your ex-girlfriend and boyfriend. All the nights they will harass your mind till they are finished, and still that’s not the end. Exam turns your life upside down. So just go through them as soon as possible. Best of luck! In the exam you may get 00, we won’t say you anything. But there is a condition. Those 00 should have a 1 before them. All the best for your exam! Exam is the best way to get rid of a teacher you don’t like. Good luck! Don’t let these puny exams get in the way of your big dreams and ambitions. Save all the stress for bigger things in life. Good luck. Bad grades like your exes. Best forgotten, because you know that you can do much better. All the best. When exams are near, It is common to be engulfed with fear. Relax, you will excel in your test. All the best and leave to God the rest! I wish I could sit for the exam with you. But its not possible. So, I pray to god that he turns all your hard works into high marks! You deserve no less than the crown of the top scorer in the exam. I know you can do it. God bless my beautiful girlfriend! If you can write your exam paper half as beautifully as you tomorrow, you’ll get the top marks for sure. I am counting on your success! You have prepared yourself so well for the exam, that nothing can stop you from getting an A+ tomorrow! I have no doubt of your success! You have passed the exam of love. Now, its time to pass the exam of your college. Trust me, this time questions will be much easier! Anyone who is so dedicated towards his study can make a great result in the exam. I have no less expectation from you than this! You have given your absolute best for preparing yourself for the exam. Its time for me to pray for you so you be awarded with a great result! Marks are not important. It is more important that you keep calm and learn to apply your common-sense during exams. Good luck to my boyfriend! You don’t need luck to do well in the exam. Students like you are born to do miracles in the exam. Have a great exam dear! I have high confidence that you will prove once again why you are so awesome. Have a great exam tomorrow dear! Wish you all the best! 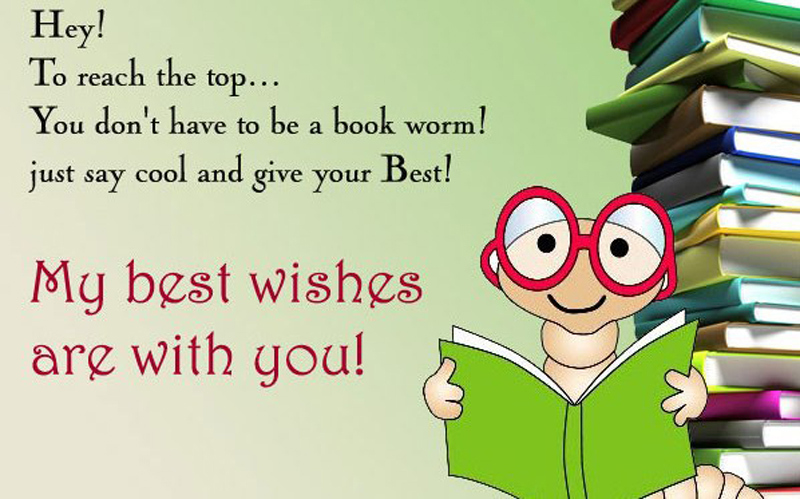 Wishing you all the very best for your exams, students! Good luck! I know very well about your improvement in the class. Its time to show us all how intelligent and talented you are! Best of luck! It’s always very satisfying to see someone doing extra-ordinarily well in the class. I believe you can do the same in the exams too! I have high hopes on you. I know you have prepared yourself very well for the exam. I can’t wait to see you making it among the top 3 once again! Its time to prove that you have a very intelligent mind as we always thought. Keep yourself calm but ready to make a difference in the exam hall! As a teacher, I’m always proud to have a student like you. I hope my lectures will help you to get an A+ in the exam! Exams don’t test your knowledge as much as they test your state of mind. Be relaxed and calm down, I am sure you will do fine. Best wishes to you. Hard work always pays in life. You can reach every aim you want. I wish you all the best for this hard work. Hundreds and thousands of people in the world give exams every day. Surely, something so common and ordinary can’t be too difficult. Good luck. You worked hard in school all year long, and now you will use this knowledge! Everything you learned will be needed today! 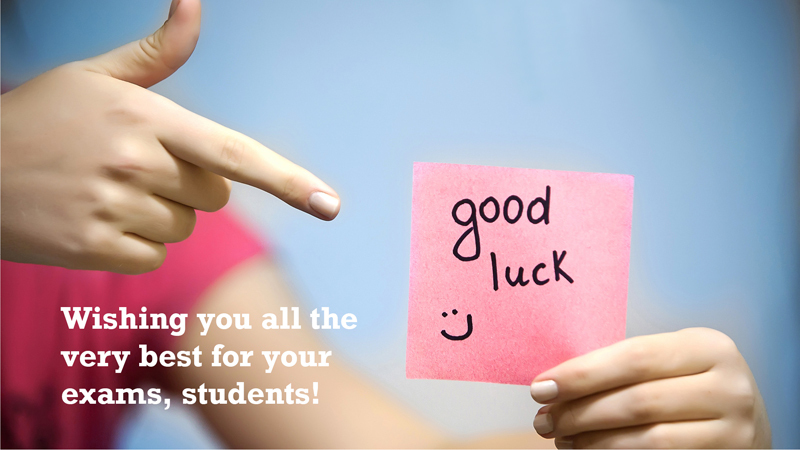 Remember everyone wishes you good luck, the teachers, friends and family! 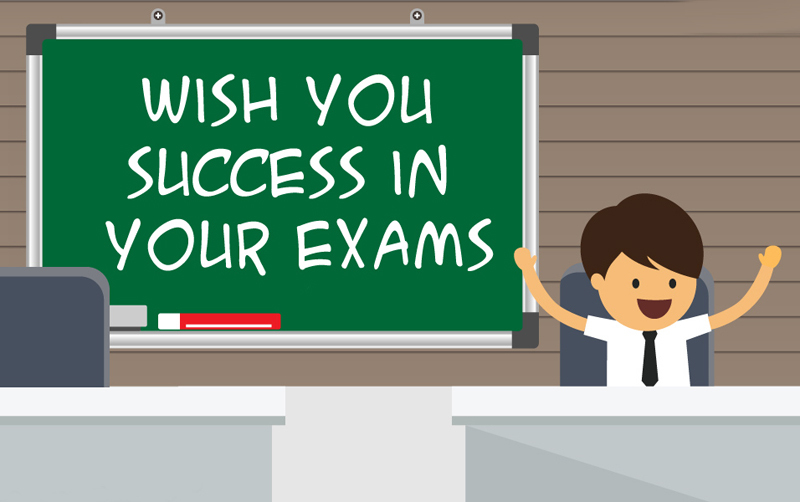 Above listed exam wishes and messages are appropriate for any kind of relationship, you may send exam wishes with these messages to son, daughter, students, friends, colleagues, boyfriend, girlfriend and besties.